UFO SIGHTINGS DAILY: Huge UFO Over St. Louis Cardinals Game On May 3, 2016, Photos, UFO Sightings Daily. Huge UFO Over St. Louis Cardinals Game On May 3, 2016, Photos, UFO Sightings Daily. This witnesses photos are really big. Probably using a very powerful camera when taking these photos. These you see here are just very close up screenshots of the photos I made. 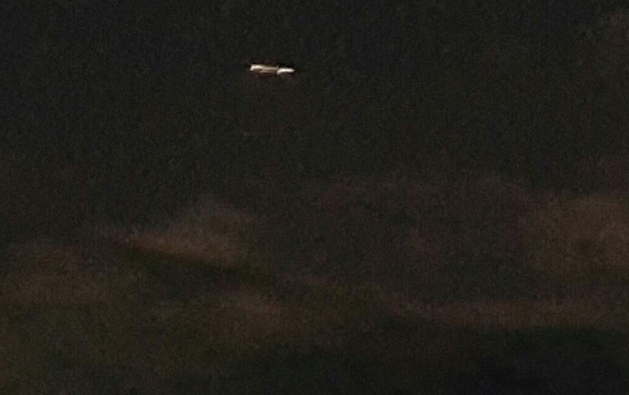 We can see that the UFO does look metallic between two bright balls of light. In others its long and thin. 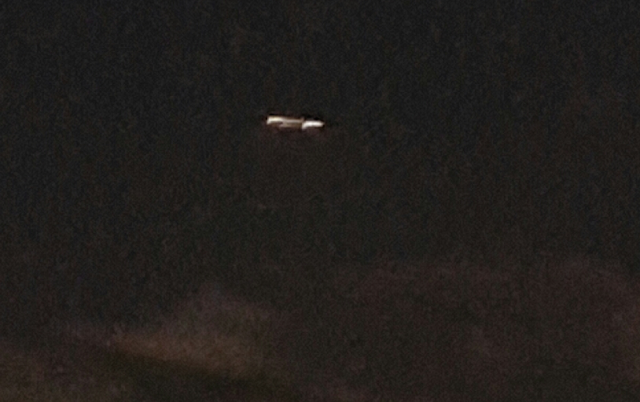 This UFO is really high up and had to have shown up on radar for that area. This object must have been big, because it was seen from a great distance away and his photos are really fantastic. How could others not see this you ask? Others did see it, but often 95% of the people who see UFOs often dismiss it, but later end up regretting not taking it more seriously at the time. My family and I just left the St. Louis Cardinal game, we were driving west on hwy 40, I was the first to see it. Off in the distance (approx 4 or 5 miles away) in the west (SW from our current position) I could see an extremely bright row of lights (4 round very large set of lights side by side). Like stadium lighting. I pointed it out to my husband and son. My husband said "it's just lights on top of a building or crane", "no big deal"... As we got closer to it we realized, there were NO buildings or cranes around! All highway and some trees. 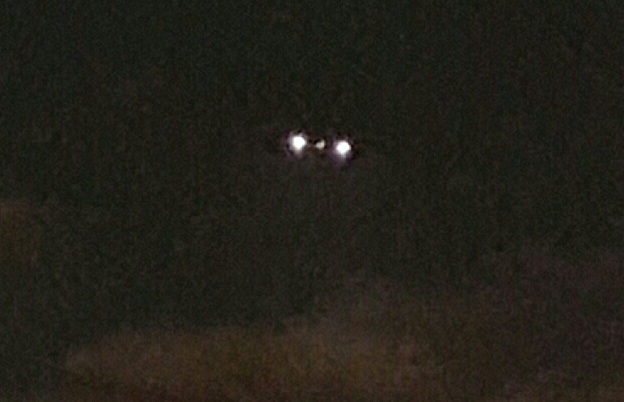 The lights were straight forward like headlights. It seemed like it was in the same spot from when I first spotted it. We got onto the off ramp from hwy 40 and were going to head south on hwy 270. As soon as we got onto hwy 270 my husband pulled to the shoulder so I could try and get some better pictures of this "floating light tower". It seemed like it was less than a quarter of a mile to the right of us at that point. Since we were stopped and now looking up at this thing we realized it was moving really super slow instead of hanging out in mid air like we originally thought. 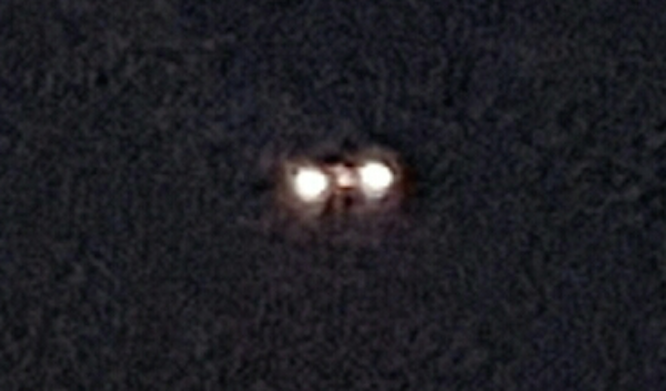 We could now see it's triangular shape and the lights were not as I described above but rather, Two in front toward the outer tip of the wings and two toward the top center. And what looked like rope lighting around the outer perimeter.The lights definitely seemed to dim down as it was passing over us. My husband said there were a set of colored blinking lights on the under side, but I honestly didn't notice them. It was bigger than our truck (ext cab silverado) and made absolutely NO SOUND?! The whole time! That was the most amazing part... How something so big flying through the air could be so quiet? And there wasn't a moment during this amazing experience, where we felt scared or threatened in any way. It stayed a safe distance above us, about as low as a helicopter would fly when doing a traffic report. As it was passing over us it picked up a tremendous amount of speed. Almost like it noticed us watching it... (I know, let's not get crazy) Then it took off straight toward St. Louis (East) then shot up ward at an angle toward the SE. Within seconds it was out of sight. Even though it was about 11pm on a Tuesday, there was a Blues game and Cardinal game that just let out... So the highways were far from empty.